Established pro Steve Sung defeats a stacked final table on his way towards a gold bracelet in the $25,000 NLHE 6 max. 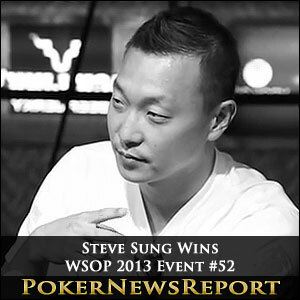 Back in 2009, Steve Sung navigated an enormous field on route to his first WSOP bracelet. The win, which was good for over $771k, vaulted Sung into the spotlight. Since then he has booked four major final table appearances, but has failed to take down another major title. Phil Galfond’s story is quite similar. After winning his first and only bracelet in 2008, Galfond has spent the majority of his time crushing live and online cash games, but hasn’t had the live tournament success one would expect from such a creative pro. 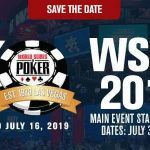 During the wee hours of Monday morning, the two 28-year-old poker masterminds would face off in what would become one of the most memorable heads-up encounters of not only this summer, but in poker history. This time around, Sung was only required to navigate a comparatively small field of 175 players. However, the competition was much stiffer, and the stakes significantly higher. Featuring a $25,000 buy-in, Event #52 brought out almost as many big names and arguably more talent than the recent One Drop and the currently in progress Players Championship. 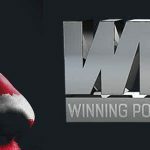 Besides the two former bracelet winners, the final table touted the likes of online whiz kid Dani Stern, and successful high-stakes players Max Lehmanski and Stephen Chidwick. Other notables who just missed the final table were David “Bakes” Baker, David Benyamine and bubble boy Shannon Shorr. But after an epic three-handed match that ended with Dani Stern’s A♠5♠ falling to Galfond’s Q♠Q♥, it was the two one-time championships who would face off for poker gold. And what a battle it was. After battling back from a 3:2 chip deficit, Galfond would find himself with a modest chip lead when the hand of the night, and quite possibly the entire summer, occurred. Sung raised to 250,000 with K♦10♠ and Galfond called with 4♣3♠. The flop brought 10♥8♠Q♣ giving Sung middle pair. 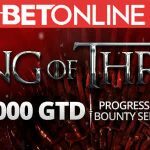 Sung continuation bet for 300k, and Galfond raised with air to 1.075m, and Sung called. The turn was the 9♦, adding a gutshot to Sung’s pair. Galfond bet 1.25m, and after tanking for a bit, Sung essentially told Galfond that he didn’t believe him by min raising to 2.5m, leaving Sung with only 1.8 million chips behind. It was then that Galfond’s exceptional poker mind went to work. For the next seven minutes plus, he debated whether going all-in would get Sung to fold his hand. If Galfond did ship the rest of his chips, Sung would have been forced to make the Hero call of his life. Alas, Galfond ultimately decided to fold in what amounted to a leveling contest rarely seen in live tournament poker. On the final hand of the contest Galfond three-bet shoved with K♠Q♥. Shockingly, Sung called off 2.24 million with a mere J♠10♦. The flop of K♦10♥J♥ was a doozy, giving Galfond top pair and an open-ender and Sung bottom two. The turn and the river were bricks, and Sung was awarded the title and over $1.2 million in cold hard cash. Sung’s million-plus payday was the seventh time a player was awarded over a mil in this year’s WSOP. Five of those cashes were handed out in the One Drop and the other in this year’s Millionaire Maker.